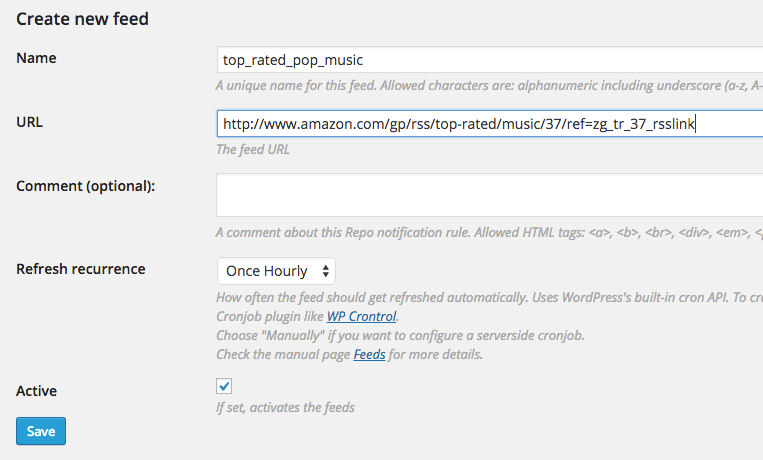 With “Feeds” you can use Amazon’s RSS feeds to automatically embed the feed items in your pages. To create a new feed, navigate to ASA2‘s section “Feeds” and click the button “Create new feed”. On the “Create new feed” page, enter a unique name for the feed and the feed URL. To find the feed you are looking for, please check Where to find the feeds?. For “Refresh recurrence” you have to select when the feed will be refreshed. Amazon updates their feeds every hours, so a good choice would be “Once Houlry”. ASA2 stores the content of a feed in the database, so it is possible to choose a recurrence higher than one hour. You can choose from different values provided by WordPress’s Cron API (the internal system for scheduled tasks). Choose “Manually” if you want to use the server side cronjob to refresh the feeds, see Feed refresh. If you can not find the recurrence you need, you can create your own. I recommend the plugin WP Crontrol for managing custom time intervals. After you have installed it, go to section “Settings / Cron Schedules” and add a new cron schedule. After you have successfully saved a new feed, it will appear in the list of feeds. In the list of feeds you already see the shortcode to embed it in a page. Click on the shortcode to select it. Now you can copy and paste it in your posts or pages. There are some helpful options you can use with [asa2_feed]. Especially useful are the options offset and limit. You can use them to only display a certain part of the feed list. See chapter [asa2_feed] for more details about the shortcode. A good starting point is to open the “Best Sellers” page of the shop of your choice and then navigate to the category and department you wish to use. 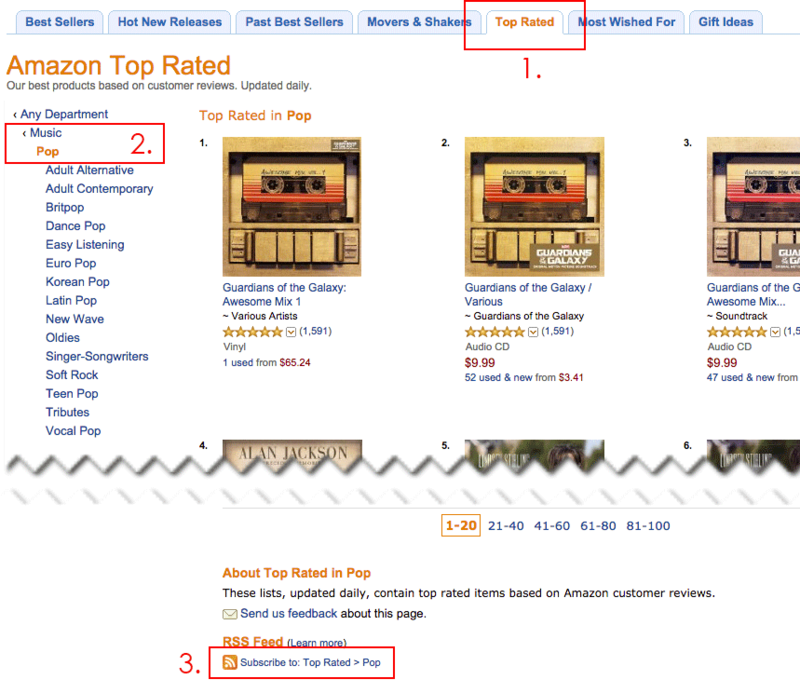 For example, to get the feed for top rated pop music, you have to click the tab “Top Rated”. Then navigate to departement “Music / Pop”. Under the list of products you will find “Subscribe to” with the label of the selected department. You can copy this URL and paste it to the ASA 2 feed form. The following are examples of how you can convert the URL of a bestseller website into an RSS feed URL. Please refer to options page Feeds for more details about the “Feeds” feature options.